Stroganov Palace in the center of Saint-Petersburg is a unique building in Baroque style made in the 18th century. This huge mansion used to belong to the family of merchants Stroganovs. Its history demands our special attention. In 1742 Baron Sergey Stroganov bought a wooden house on Nevskiy Prospect. To rebuilt it he hired the most famous architect in Saint-Petersburg – Rastrelli. Being a court architect Rastrelli never dealt with building private houses but made an exception for Stroganov. It took only two years to make a palace. For the new home celebration in 1754 Stroganov arranged a beautiful ball where even Elizabeth, the daughter of Peter I was present. She liked the palace of 50 rooms so much that celebrated her next birthday in it also. Later Sergey’s descendants owned the palace. His sons Alexander and Paul introduced corrections both into the inside and outside design of it. In the end of the 18th century there happened an awful fire that ruined almost the whole palace, only Ball Hall survived. It is the only interior created by Rasstrelli that does not need restoration. 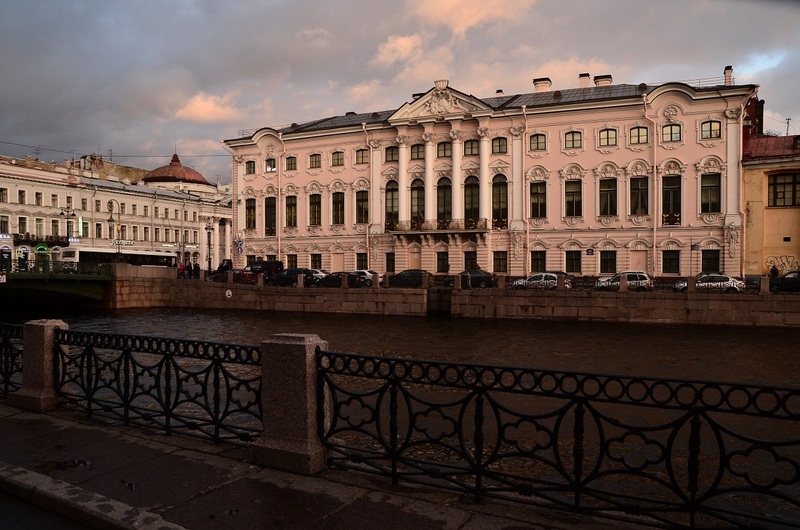 Little by little Stroganov Palace was revived and again became the center of the cultural life of the Northern Capital of Russia. Many famous people visited its balls and masquerades. This Palace had beautiful collections of paintings and sculptures and its library was considered to be outstanding and the richest in the country. Stroganovs lead a very prosperous life having 600 people to serve them. The family was quite generous and very often arranged so called “open dinners” in the courtyard of the palace which could be visited even by strangers and not rich people. At such dinners the guests were treated with the most delicious dishes. The recipe of the famous Russian Beefstroganoff was first introduced by the chef of this family. After the Communist Revolution Stroganovs were deprived of their palace and had to move abroad. Nowadays Stroganov Palace belongs to Russian Museum of Saint-Petersburg.